Lil' Sub-Hilt™ G-10 Black - Spyderco, Inc. Page 1028 – Spyderco, Inc. Designed by renowned custom knifemaker Butch Vallotton, the Lil’ Sub-Hilt is a more compact, pocket friendly expression of his first Spyderco collaboration, the Vallotton Sub-Hilt. Like the original, it features a beautifully crafted handle constructed with full skeletonized stainless steel liners and stainless steel bolsters. They are paired with contoured, polished G-10 scales and complemented by matching G-10 inlays in the bolsters. The result is a stylish sub-hilt-style handle with a custom-quality, seamless fit that accurately replicates Vallotton’s coveted custom knives. The blade of the Lil’ Sub-Hilt is equally stunning. Painstakingly crafted from CPM® S30V® stainless steel, it features hollow-ground main bevels with contrasting flat-ground tip bevels for a superior balance of edge geometry and point strength. 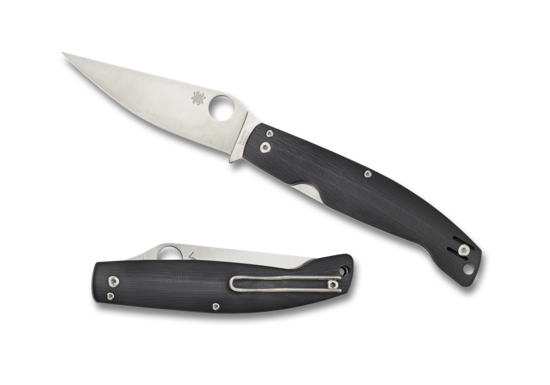 It proudly includes both Spyderco’s Trademark Round Hole™ and Vallotton’s signature thumb stud/stop pin to ensure swift, fully ambidextrous, one-handed opening and an ultra-secure lock-up of the knife’s stout LinerLock mechanism. To support all possible carry preferences, the Lil’ Sub-Hilt includes a four-position pocket clip that provides tip-up and tip-down carry on both the left and right sides. A remarkably refined folding knife, the Lil’ Sub-Hilt faithfully distills all the custom-quality features of its larger counterpart in a sleek, pocket-friendly format that is ideal for everyday carry.